Safe & sound. Answer all your electrical needs with a single phone call. DryZone, LLC will help you evaluate your options for repairs, upgrades and replacement work to make sure you get the best performance and value. DryZone, LLC is a licensed electrician specializing in electrical installation and repairs. It's easy to take electricity for granted. Most of the time, it's always available when we need it. But when something goes wrong with a home's electrical system, the effect can be devastating. A heating system can shut down, water can stop flowing and appliances can stop working. Does your home need a good electrician? 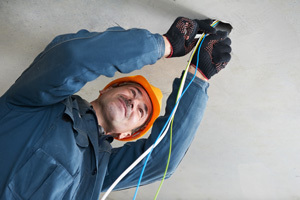 Sooner or later, it's really important to have an electrical contractor you can count on for speedy, reliable service. DryZone, LLC is ready to earn your business. Whether you need a ceiling fan installed, a water pump replaced or new wiring for a home addition or new construction, our technicians have the training, tools and motivation to do excellent work for a fair price. We provide free estimates for all electrical work in Severna Park, Crofton, Arnold and nearby. Contact us today! DryZone, LLC is Delmarva's full-service electrician. We provide free estimates for electrical upgrades and improvements, and custom lighting and energy-saving solutions. You can reach us by phone at 1-855-554-5001 or contact us online for an appointment.